One overhead fan beats back the thick humid heat of the Kolkata morning that seeps through the open door. The lights stay off to keep the place cool but leave the office feeling cave-like. A cave sounds a touch too primitive to describe the office of the founder of the Society for Environment and Development, a network of professors and professionals—spanning across multiple disciplines—that try to convert climate and sustainability ‘talk’ into some much needed ‘action’ in India. So let’s call it a lair. Remnants of a life’s work overflow out of trophy cabinets, off of shelves, and reshape pin boards to into complex geometries. The desk is unconventional for this day and age. A worn mechanical pencil sharpener perches off of the side. There’s no computer next to the topography of paper stacks, but a elegantly arched wooden smoker’s pipe. The sole piece of technology besides the light fixtures is a Samsung phone that rings constantly. Hindi, Bengali, and English regularly spoken through each end of the line. Behind the desk sits now 76-year old Dr. Asish Kumar Ghosh in an off-yellow, cushioned armchair. The high-backed armchair looks throne-like in contrast to the small stature of the scientist and professor. From his chair he addresses his audience directly, with a gleam in his eye that’s mirrored by the white of his neatly trimmed monopoly-man mustache that frequently twirls up in a delightful grin. Across the room is a painting of flowers. The composition shows a cross section of soil—the greens, whites, and browns in the painting evoke the aesthetic of the West Bengali rice paddies. The design looks like it borrowed equally from the influences of islamic architecture and from a collection of child’s kindergarten paintings. The painting is a relevant symbol, for Dr. Ghosh is in the business of spreading seeds. We sat down for what I at intended to be a conversation that turned quickly—and fine by me—into a lecture. Seeds were the topic of conversation for the day. I was happy to have Dr. Ghosh, or Sir as all of his employees and students call him, impart his wisdom onto me. He’s one of India’s pioneer environmentalists and a household name amongst the environmentally conscious nationwide. And there began what reminded me almost exactly of a one-on-one class with a Bowdoin College professor. Unlike Dr. Ghosh, I do not hold a PhD in Agricultural Science so I apologize for any misuse or bastardization of technical terms—terms which I’m going to try to avoid using anyways. Over the past couple of millennium that humans have settled in the Bengal region of South Asia and farmed, 6,000 differentiated varieties of rice have developed. Each of those 6,000 species were selected for their resiliency in a particular sub-ecosystem, altitude, or terrain. Some could withstand droughts, others monsoons, a few grew even in the brackish water in the tidal delta region. And that was just rice in Bengal. Zoom out across India, and you would have found thousands upon thousands of specific sub-species of rice, wheat, and millet with unique properties that farmers had passed on from father to son through the generations. The decades after World War Two were marked by hunger, famine, and food crisis in India. In the late 1960s, the Green Revolution swept South Asia and combatted food shortages by farming with ‘miracle crops’ and heavy uses of fertilizer, pesticide, and industrial irrigation techniques. Crop yields soared and brought an India in crisis to food security. India is still an exporter of food today, even with its unwieldy population growth—India’s 1.2 billion people are targeted to reach 1.5 billion people by mid-century. Despite the broad successes of the Green Revolution, it didn’t come without its drawbacks and unintended consequences. For example, there is a train line that runs south from Punjab to Gujarat that has been dubbed something akin to ‘The Cancer Express.’ Because of the use of a certain fertilizer in Punjab, there is a high incidence of cancer in those agricultural districts that has been irrefutably linked to that chemical use in farms there. Farmers from Punjab take the train to Gujarat for treatment. The same fertilizer is banned in the United States, but the food grown in India with it is probably still exported stateside. Additionally, although there is excess food production—storage containers fill up regularly and leave waste outside to rot—the poorest of the poor still go hungry in India. It is cheaper to let the food sit and rot outside of storage units than to distribute it among the neediest of the 37% of Indians who live below the poverty line. And finally, as Indian farmers adopted western farming practices, they lost touch with their traditional knowledge, especially about the diversity of their seed stores. With no concept of a need to preserve those seeds, they abandoned their heritage of knowledge of seeds developed over time. In an attempt to achieve short term food security, Indian agriculture lost long term resiliency and their diversity of subspecies that can withstand a wide spectrum of climate conditions. Dr. Ghosh has seen this agricultural transformation occur in his lifetime. In the late 60s, he was studying for multiple PhDs in Madison, Wisconsin as a Fulbright Scholar. (Before leaving, he needed to take an oath at the US embassy swearing that he wasn’t a communist. In Madison, he was featured on the front page of a newspaper participating in an anti-Vietnam War rally. The picture got back to the embassy and he got in a bit of a pickle.) Although Ghosh was offered plenty of opportunities to stay on in the United States and start a career, he knew he had to return to India, indebted to serve the country and the citizenry of India who’s tax money funded his undergraduate education. And that’s exactly what he did. In one of his most recent projects, Ghosh led the Center for Environment and Development to rediscover some of India’s lost seeds that could succeed in the coastal regions of West Bengal where salt water intrusion is ruining agricultural yields. One particular region that seeing some of the swiftest environmental changes is the agricultural belt on the fringes of the Sundarban mangrove forest where salty seas are rising to the level of—or even above—farmland. Earthen embankments are the only wall of defense. While young technical academics may wiz through technology databases and infiltrate google for answers, Ghosh’s file cabinets contain information not on Google, and he was able to identify the locations of tiny samples of six species of long lost salt-resistant seeds. Some were in the archives of the National Bureau of Plant Genetic Resources and the rest were in villages in the remotest Sundarban islands. Of the six, four were replicated into sufficient quantities by scientists. The most promising could handle soil salinity of up to 7mS/cm, a measure of conductivity. Next, Ghosh reintroduced those seeds back to villages. He told me that the village farmers seemed to realize how special these new—but old—seeds were. A song was written about them and they were called the miracle seeds! After each crop cycle, farmers took a bundle of the seeds to store away among their most important possessions. Since the project, the seeds have been protected year after year and the stewardship of these plants was taken on board by the villages themselves. Dr. Ghosh has made the human-inhabited Sundarban region more resilient. For free. “Asish’s job is over.” he said to me. He helped the villages rediscover their traditional expertise then left. He’s hoping to reintroduce these seeds to the whole coastal agricultural belt bordering the Sundarban, that’s 220km of West Bengal coastline. Soon, he’s traveling to the Odisha on the middle east coast of India for the delta migrations project, but he told me he’s going to take the seeds with him in his back pocket and try to get it started there too. Dr. Ghosh has developed a demeanor with students that he must have adopted during his years in Wisconsin. He spent over two hours lecturing me, with an intermission for Darjeeling tea. Ghosh clearly shows that he takes an interest in the ambitions of young people. He often remarks on the successes of his old students and boasts about the feats of the most accomplished. His students are his other bag of seeds. They seem to be everywhere; a growing force of environmentalists. Later on that afternoon, I walked six blocks north to another office building to see one of those students, Dr. Anurag Danda who is now the Head of Climate Change Adaptation & Sundarbans Landscape for the World Wildlife Fund India. Dr. Danda wore a patterned short-sleeved shirt that would have been a huge hit among the trendiest canal lanes of Amsterdam. He even spoke english with an accent as if he were native Dutch. But Danda was born and raised in the Indian state of Maharashtra—even though he identifies as a West Bengali now (That’s like an LA person becoming a New York person). His intriguing dialect was adopted while studying in the Netherlands for his PhD. His thesis was on water management and adaptation to climate stresses in the Sundarbans. He literally took lessons from the Dutch and modified them into an in depth analysis of the Indian mangrove delta–but he did that two decades before the rest of us. In Kolkata, he told me, there is a lot of climate talk, but little to no action. As an organization without access to big sources of funding, the WWF office mostly directs it’s energy closing the loop between the science, the villages and the politicians. They crosscheck recorded climate patterns and see if they are observed by the villagers themselves, who are for the most part absent minded to the formal academic concepts of ‘climate change.’ But if the villagers say, “oh my, we do see the soil getting drier!” that verifies that changes in the data are mirrored by empirical evidence in the real world. In addition to their work in the Sundarban, WWF India’s other climate adaptation project works to improve the health of the Ramganga tributary of the Ganges. Politicians will not get interested in climate adaptation projects unless there are hefty price tags and whispers of gigantic sums of money transferred between bank accounts, I was told. Politicians won’t be interested in anything short of large-scale hard infrastructure adaptation projects. But something like a multi-billion dollar flood gate project doesn’t match the geographical nature of the area here. The Sundarban mangrove is Kolkata’s front line, a geo-engineering project by Gaea her wonderful self. The most vulnerable, all 4.5 million of them, live on inhabited mangrove islands just inland of the protected nature reserve. The adaptation investment that is needed is not a Bay of Bengal Wide concrete wall, but reinforcements of the hundreds of kilometers of earthen embankments which hold back not only the freshwater flowing south in the rivers but also the saltwater of the high tides that the Bay brings. Behind the embankments are villages, agricultural land, and 4.5 million lives. On May 29th, 2009 Cyclone Aila destroyed 900km of such embankments as 125 kilometer an hour winds and 40 foot waves barraged unapologetically through. Salt water flowed out onto so much agricultural land and ruined the soil to such a degree that growing rice in 2010 was impossible. (The next season Ghosh came down with his salt resistant seeds). 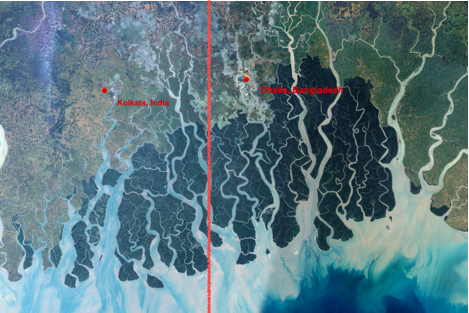 The Sundarban dikes are earthen soil embankments, significantly less high-tech than the concrete dikes that stitch the Netherlands landscape together. The Dutch have doubts about the longevity and efficiency of their professionally engineered dikes. And here in India with the bonus threats of earthquakes and cyclones, villages rely on farmer-constructed earthen walls. The thoughts give me flashbacks to being back on the beach as a kid, no matter how much sand I’d add to my sand castle’s walls, the rising tide and rolling waves would always win. Just, the stakes are a bit higher. After Aila, many of the dikes were left unrepaired. There was a question of ownership and a good reason for confusion. Ashoka was a king who ruled the Indian subcontinent before Christ. In his time the Zamindari system started. A landlord would build an embankment around an island and lease out the land for economic extraction—farming, honey collection, fishing—as long as taxes were paid to the landlord. It was in the Zamindar’s private interest to maintain the structure of the embankments. A similar system existed until 1947, India’s independence. Since then, the upkeep of the Sundarban dikes has been passed around from department to bureaucratic department. The department of agriculture developed an adequate maintenance system, but then an amendment to the constitution gave the duties to another bureau so the office with the good system no longer has the funding. It’s like trying to solve a puzzle where the pieces are tossed between three scrambled up boxes. And each box is locked. A Bengal tiger swallowed the keys. So who is responsible to rebuild? The tide people are waiting, expecting the government to show up. At the same time that it is unfair to place the burden on impecunious people who lost a year’s supply of crop yield, homes, livelihoods and loved ones to strap up and re-build, it’s those very people who have chosen to live in a volatile landscape. Maybe it’s the premium people need to pay for living on vulnerable areas of the coast. And I think paying a premium is exactly right for those who own vacation homes on Cape Cod or Long Island in precarious landscapes, but for people such as these who have been forced to come to the Sundarbans to find refuge from religious, political, or social persecution—because they have no where else to go—the question of who pays becomes a little bit more twisted. It’s easy to say: the cost of living here is too high and all ‘tide people,’ as they’re referred to in Amitav Ghosh’s novel about the Sundarban’s The Hungry Tide, must move to the interior of the country. But there is another, often overlooked human element involved—the deep attachment and association to what people call to home. In the Sundarban, the people have just as many roots into the mud as the mangroves themselves, and no matter how hard the waves crash, they want to stay. This fictional paragraph was verified by an economic experiment. Dr. Ghosh told me that a micro-finance, small loans bank, similar to Grameen Bank, offered to give families a significant amount of money—more money than the many of the village woman the loan was offered to had ever held in their entire lives—to move inland. In a notable quantity of cases, the loan was declined. They wanted to stay. In a place where natural disasters are seen as an act of god rather than an effect of a climate system, a place where Bon Bibi, the forest goddess, is worshiped for luck and fortune, there may be more involved than climate scientists in Europe think. It’s not just about packing home and moving. They may go down with the ship. I asked Dr. Danda about whose duty it is to pay for the costs of climate change. He is optimistic that climate change is an opportunity for nations to work together. Climate change in Danda’s view is the first time all nations can work together against an outside adversary. “We’ve never been attacked by extra-terrestrials,” he said, then began to pipe up, “but climate change is by and large a threat to humanity itself.” It’s a reason for nations to cooperate; a call to arms to fight for the common good of mankind. So, in Danda’s mind, the payment question comes from the very top. But he also thinks it comes from the very bottom, from the personal and household level. It’s in the private interest of individuals and households to pay for their own defenses. Choose to build in a risky location you should have to pay for it. At the end of the conversation, Dr. Danda told me he fears for the world his granddaughters are going to be born into. But he doesn’t have a doomsday attitude. He seems to be exactly the right type of bright minded person needed to be head of Climate Adaptation in India. He’s currently stocking up on more tools at the Dutch armory as he is working at TU Delft in the Netherlands for his second PhD now. In South Asian cities, where addresses are based off of proximity to landmarks rather than numbered locations on uniquely named streets, a quarter-million-dollar education will not help you find the means to explain where you are intending to go to illiterate cab drivers. One guy drove me into the completely wrong corner of the city. At the get go, he was so sure of himself and confident of where he was going. But I knew something was awry because we hadn’t traveled east at all off of the main road. He took me directly south, maybe even southwest. I knew from comparing the route of the car to my memory of looking at the map the night before, that we needed to be in the other corner of the city. I didn’t mention anything, because maybe I had absentmindedly missed a turn. Sometimes these cabbies have tricks up their sleeves, too. This guy seemed superbly confident. He was my age and at every red light would pull his whole body out of the window to comb his hair in the driver’s-side rearview. He stopped at two water pumps during our 15 minute journey, once to fill up his water bottles and chat with his friends, and a second time just to chat with his friends. Addresses work as place name (David’s guesthouse), place site (neighborhood, housing community, or landmark such as Jodhpur Park, a community of houses, or Jama Maslij, which means the big mosque), then finally a more general locality or ward in the city. The address where I was trying to go was Sharani Lodge, Hindustan Park, Kalighat. I had the help of 10 other cab drivers and pedestrian onlookers surrounding my cab as I negotiated destination and determined the price. The cabby selectively heard park and drove me to a park he knew of. As he leaned over the seats expecting to get paid, I informed him we were not where I had asked to go and gave him the phone with the manager of the guest house I was moving into. The journey continued for another 10 minutes as we laterally crossed town. We arrived and he demanded that his pay– our set price agreed upon when we started–to be doubled. I politely refused and crafted a series of under-appreciated arguments of why he was rude, arrogant, and inconsiderate to ask for more money. Point a. I had asked to travel on the meter before I got in the cab, but he refused and insisted on a fixed price. Had he granted my wishes in the beginning, his wish to be paid more would have been granted in the end. He didn’t understand my logic. Point b. I asked him who got lost? That got him thinking. I had paid him the price we agreed, but he still wanted more and got out of the cab and into my face as I was walking into the guesthouse. Point c: I posed a hypothetical scenario: lets say you order a chai. The chai wallah drops the chai at your feet by accident. No chai. The chai wallah gives you another chai and you enjoy it, happily. How many chai do you pay for? One, he said to my delight, but failed to connect the hypothetical to the real. He was very, very angry at me for not compensating him for his mistakes. Due the the geographical pinpoint nature of the addressing system here, I’ve been having a lot of trouble getting to my guesthouse in just one go. Today I needed to take three different taxis to get home. It’s amusing thinking about now, but in the moment it’s as if someone is chiseling away at your nerves, your loneliness, and your insecurity. Lost in Kolkata. It sounds like a reality TV show. This game is not for the faint of heart. But, the Kolkata taxi game has an element of what I know as the ‘Mario-Cart effect.’ Mario Cart is a Nintendo 64 video game that has retained its popularity ever since it captured way too much of the idle time of way too many kids in the western world in the late 1990s. When you are losing really badly in Mario Cart, you start getting great power ups that help you get back in the lead, such as lightning that makes all other vehicles miniature so you can squash them! Although in Kolkata, the squashing happens without magic lightning. I cringe when I hear screeching breaks and gasp to catch my breath when the screech absorbs back into regular traffic sounds rather than crescendos into an ugly a crunch. Today I saw a lady on a moped get hit by a car. I’ve also drawn invisible lines between lamed and amputee beggars and hurtling buses that thrust across intersections with neglectful speed. When you are close to the breaking point in the Kolkata taxi game, the drivers seem to know it and do their best work with you to get you where you need to go without ripping you off. My spark-notes tip: older taxi drivers. They more often than not resort to using the meter without being asked, so there’s no ambivalence or bargaining required. They know more about the city and where you might want to be going and they don’t drive too fast in these rickety machines that are literally sometimes held together by cardboard, rubber bands, and duct tape. The city taxi fleet is comprised of HM Ambassadors, an iconic Indian car. They are just as common, probably more abundant than, yellow cabs in New York. They look more yellow in contrast to the backdrop of rotting colonial buildings, tangles of black telephone and electrical wires, and plenty of dirt and grit. They are all outdated and give you a feeling that you’ve traveled back to 1985. Admittedly, I wouldn’t know what 1985 looked like, being -5 at the time. But I’ve heard repeatedly that there are cities like this–Havana, Cairo, Montevideo–that seem to be stuck in a time warp. As a result, wifi connectivity is more difficult than you might expect to come by. I spent the morning this morning at Vodafone. I was told that I could get outfitted with a zip drive that held a simcard with data capability and give me internet access on the fly with my laptop. Easy. Not easy. It’s notoriously difficult to get a sim card in India without a resident reference or a ready supplied sim card through your job, school or business. I did my homework and came into Vodafone with references, passport copies, photographs, and all the relevant documentation in hand. I waited for 45 minutes as they fumbled over my forms, clearly confused by the logical organization of United States addresses. So how far is 38 Occom from the Big Mosque? I signed the document, but then the whole process was denied because my signature did not match the signature on my passport. My passport was issued in 2007. That was 7 years ago. I had never worked a job in my life, I never had signed for anything in my life. I wrote my name down next to my blemish and acne filled pubescent face and called it at day, probably ecstatic to get out of the passport issuing office and get myself a cheeseburger. Little did I know then that I should have tried harder to come up with the definitive signature I’d use for the rest of my life because one day, about 6 years and 11 months from now, some guy in a Vodafone store in South Kolkata, India won’t grant you a little microchip so you can briefly time travel back to the future and write some emails. Do you follow? I asked for the manager of the store and pitched a—this time more appreciated—argument about how ruthlessly illogical their reason was. I asked a lady browsing in the store if there was any resemblance between the (2007) picture on my passport and the (2013) picture on my India Visa. She said, no not at all. Right. I’ve grown up and my face has changed. My hands have probably changed too, and as a result I can’t write the same way that I wrote when I was a 17 year old. In fact, I am probably not the same person who wrote that awful scribble on the page, 7 years and 33% of my life ago. For the economists reading this, I figured I’d get more utility out of being mad and starting an argument (I was convinced of their illogical stupidity and was determined to tell them how I felt) than I would from peacefully and calming resolving the issue so I left the store and got in the first of a sequence of three cabs back to my temporary home. I tried to take the Buddhist approach: worldly desires lead to suffering. So avoid worldy desires. But honestly, Buddha lived in a very different time. I sort of envy him for that; I think he had an easier platform to start from. I needed to book a plane ticket and organize the immediate months of my life and nowadays that all takes place in the arena of abstract space on the web. The internet is an integral part of our lives now. In fact our lives exist on it. Until you take a trip to Kolkata, you have no idea how marvelously convenient Starbucks and wifi connections in cafes are. I regrouped and headed into the city center for another stab at it. I serendipitously ran into two wonderful Canadian girls who brightened my day over lunch. Unfortunately they are leaving for Thailand tomorrow. I solved the problem after lunch. I found a roundabout way to put the data capabilities for internet on my phone sim card then only had to buy the hardware of the zip drive to connect all the pieces. I just have to take the sim card out of my phone and put it in my computer when I want the internet. I wrote a long and thoughtful post about my train trip from Varanasi to Kolkata and the discomfort of being confronted face to face with poverty and begging in India. It was written out on the blog when I was offline and it, to my devastation, nothing saved and the window deleted, so I love everything. That was one event in a long strains that could have been featured in a chapter of a Lemony Snicket, Series of Unfortunate Events books. This was after I had my body whooped by a bout of severe Delhi Belly, had slept for 36 hours, listened to one street dog probably kill another street dog suffering while suffering on the toilet, and couldn’t stop thinking about how many days I’d rot in this cheap hotel room in Kolkata before anyone found my dehydrated corpse. It was bad, really bad. The low point of the year. Rock bottom. In the days before, I was doing well. I was happy to have moved on from Varanasi as much as I enjoyed my time at Kriti Gallery. I was connecting with Dr. Asish Kumar Ghosh, who is a 76 year old professor and one of India’s preeminent environmentalists at his home which doubles as India’s Center for the Environment and Development. He’s a yoda like figure—in mindset and stature. More to follow on him later, he’s well worthy of a full post. I had gotten involved with the Kolkata Jungle Crows Rugby Team which takes a huge percentage of impoverished kids and gives them important motivation and structure in their lives. The crows also have a foundation which introduces rugby to rural villages and holds training camps. They traveled to a village on the fringes of the Sundarban on Saturday, a place right in line with my project research and I was crushed to have missed that. I also spent hours and energies getting my Bangladesh visa issued. That afternoon to celebrate, my body decided to rearrange interior decorations and put everything inside, outside in the most violent and abrupt means possible. Although Varanasi is 1/10th of the size of Mumbai, Delhi, or Kolkata, the station is the most hectic of all I’ve seen. It’s a pilgrimage city and the train is the common man’s vehicle so that made sense. But people were everywhere. It was like being at an urban park on a Sunday afternoon, but it was a tuesday night. There were groups sitting around on every free square foot of the platforms floor. You had to tiptoe within bodies to get around. Although trains were coming and going from the 6 platforms, there was an atmosphere of stagnancy. I was thankful that I had taken long distance trains before, being in the heartland of India in Uttar Pradesh there were no english signs or call-markers that predicted where certain carriages would show up. The trains are devilishly long so I aim to be in the general location of where the carriage will arrive. Here in Varanasi there was no marker so I plopped down right in the middle of the station and watched time pass around me. I remember watching a fly dance around. It landed on my arm, then I followed it onto a shoeless sweeper lady, at the bottom rung of the caste system, then onto a handsome elderly couple that were sitting facing each other, creating an intimate moment among the chaos, not saying a word while sharing a bag a grapes that was resting upon their basically empty and airy suitcase. I felt at peace just sitting on the track watching the world unravel as it should. My personal reality came rushing back as as stubbed hand was forced in front of my nose. Situations such as these are some of the hardest I’ve had to navigate in India. As someone who has grown up in the world and been granted everything, I feel that I’m not allowed to say, act, or do anything to move beggars, who were born into opposite luck, away from me. I also think that giving one individual money is more of a neglect of the real problems and causes of poverty. It reinforces a mentality that they can live another day off begging rather than trying to make structural and systemic changes to improve the lives poor people lead in general. Also, if I gave one person 10 rupees, then I should give 10 rupees to every person who begs, theres a point where I myself run out and need to beg myself. Over the past two days I read Nobel Peace Prize winner Professor Younes’s autobiography, A Banker for the Poor about his work starting Grameen Bank to give micro loans to incredibly impoverished women in Bangladesh with great interest. There was one point at the Agra Train Station, where a legless kid my age stood in front of me for five full minutes looking piercingly right into me. I alternated between looking at him (I couldn’t stare at him too long without feeling condescending) and looking around the station away from him (I didn’t want to seem like I was ignoring his existence). I refused to move or walk away, because this kid was just one example of many millions of lives that exist and it’s something that needs to be confronted rather than run away from. My Dad was standing there a notch behind me and can attest to the difficulty of finding the best way to act. Some of the sights of deformations and poverty, especially some of the first times I witnessed such things in Mumbai outside the Haji Ali Mosque, or the deformed man who followed me back to my hotel on bike in Kochi have stuck with me since I witnessed them and sometimes even follow me into my dreams. After the lady with the stubbed and burned hand walked away, I continued to sit. I felt a presence in the corner of my eye. I looked to my right and jumped as nose to nose, a bull walks right by me. Even in one of the most crowded places in the world, there’s room for the sacred cow. The 16 hour train ride was great. The first four hours were spent in the right berth, but on the wrong carriage. I found my correct bed and the conductor came along and—in his broken english—spoke uncomfortably loudly to be very, very careful with my belongings, seemingly bringing more attention to the presence of an outsider, than I had brought upon myself. The full moon shone bright through the window of the train, a comforting beacon of light as I whisked through the unknown darkness of rural India. I woke up at sunrise to the familiar sights of West Bangal—water, palm trees, and rice paddies punctuated by statue-like laborers outlined in the mist of the morning. The Sundarban is the largest estruine forest in the world. It’s the mouth of the Ganges river; the planet’s biggest delta. The Sundarbans cover 10,000 square kilometers of jungle, the majority of which is mangrove. It forms the apex of the Bay of Bengal’s triangle between the east coast of India and the west coast of Burma, Thailand, and Malaysia. The forest is shared between India and Bangladesh, but two thirds of the forest lie across India’s border. The red line roughly follows the border between India and Bangladesh. I marked Kolkata and Dhaka with red dots. The Sundarbans reserve is visited by thousands of tourists every year because it is a sanctuary for the Royal Bengal Tiger. There are only about two hundred big, mean, salt-water drinking felines. Territorial and solitary, tigers keep their space from one another. That means that on average, there is one tiger in every 50 square kilometers. The chances of sightings are minimal. I went down for another reason, although seeing a tiger would have been a welcome bonus. In addition to being a ecological and bio-diverse wonder, the Sundarbans have a crucial importance protecting two of the worlds fastest growing, most populated, and poorest cities in the world. Even though Kokata and Dhaka are over 100 kilometers from the Bay of Bengal, the Sundarban forest acts as a cyclone buffer. The mangroves are a protective shield, mother-earth’s storm surge barrier. The forest cuts storms off from their energy source, warm ocean water, and tames their intensity before they hit landfall on the doorsteps of these south asian megacities. Cyclones need to pass through the mangrove jungle before they reach the urban one. Officially, Kolkata is only 5 meters above sea level, which makes for a negligible gradient as the land slopes 120 kilometers towards the sea. Water looms all on sides. It flows down from the Himalayas in great rivers, ebbs and flows upstream from the Bay of Bengal, and for a couple months every year falls from the sky in the Moonsoon’s deluge. Even after fighting its way through the banded web of the Sundarban mangroves, cyclones have hit the area recently, and with devastating results. Kolkata has been lucky in recent years as cyclones have veered easterly into Cox Bazaar, Bangladesh. But more devastating outcomes loom ahead, especially as sea levels rise and drown parts of the mangrove. The loss of the Sundarbans threatens the habitat of the already endangered Bengal tiger and it threatens the livelihoods of over four million people that make their living on the fringes of the Sundarban (making bricks, fishing for shrimp, farming rice, or collecting honey (with masks on the back of their heads to confuse the tigers who always attack from behind). But the rising sea also has an effect much further down river as it hacks down the natural shield that protects two urban centers and over 200 million people. Sometimes the natural world comes up with the best solutions for things. Inventors often adapt mechanisms observed in the natural world into machines. The Sundarbans is far more effective than any designed storm surge barrier and would save Indians and Bangladeshis, many of whom can’t even feed themselves regularly, the task of funding a multi-billion dollar project to protect their homes. The Dutch, who are ahead of the curve, are trying to emulate the natural process of the Sundarbans by pumping the seabed of the North Sea into fortifying sand dunes. In India, they are accelerating the degradation of the mangroves with chemical pollution and rerouting rivers which off-sets the salinity balance and kills the species of mangroves. Before I came to India, I heard and read how utterly shocking roads are in rural India. Adam Smith, a British director who I met in London described the roads as a ‘symphony’ as he waved and interlocked his arms mentioning the array of animals, vehicles, and human traffic that intertwine into a functional chaos. Hearing those impressions for the first time, I smiled at the humor, reading through it as hyperbole. Before departing for the Sundarbans, my biggest fear was getting dragged off by a tiger in the middle of the night or drowned by a crocodile. If the animals didn’t get me, I feared the Dacoits, the armed pirates, (a tourist craft was robbed under moonlight by masked robbers in mid-february). I left all my valuables, except my passport, in Kolkata. I was only a couple kilometers out of the city when I realized that my fears were not in line with the real dangers. If I was going to be hurt it would be on the trip down between the city and the boat dock. Outside of Kolkata, heading south, the landscape is characterized by primitive mud walls protecting small conglomerations of palm-thatched houses, acres of paddies, and frequent brick kiln chimneys, emanating smoke, that tower impressively high above the squalor, poverty, yet complete brilliance of a place where humans have built communities on landscapes where humans are simply not supposed to live. The landscape looks iconically dutch, but without well-engineered dikes, cute windmills, or bike paths set apart from the roadway. Water is everywhere. The roads are infested with bikes, scooters, and motorcyles, but dominated by big trucks that speed down the cluttered roadway with the same force that a 12-wheeler would barrel through the uninhabited desert in Nevada. The bus I was on would scape by goods carriers loaded with pumpkins or coconuts. It rolled onto the siding of the thin road to miss a rickshaw so overloaded with plastic tubing that the loaded machines width was five times longer than the tuk tuk itself. You see a car carrying an excess of a dozen people, you see trucks carrying a small village, families pile into rickshaws that could barely fit three people my size. Boys hang onto the backs of trucks, men sit cross-legged on roofs, legs hang perilously off the sides of cargo-bedded three wheeled motorcycles. Life is valued differently here. I was sitting in the front row of the bus. Thick paned glass separated me from the cockpit where a driver and his co-pilot navigated the roads–that make New York City look like rural Maine, with lackadaisical confidence. It was one of those situations that happen all too frequently in India, where you are tossed into an unpredictable situation and realize that it is all so far out of your hands. Might as well enjoy the ride. I stepped off the boat and into the heat. The air was hard to breath. It was like stepping into a sauna, where the heat is so strong that it envelops you into invisible pressure that is persistently trying to knock you off into sleep. Even the dark skinned indians walked around with umbrellas to guard them against the intensity of the sun. Before getting on the tourist craft, the boat wanted a xeroxed copy of my passport and visa. The man asked for my passport, I handed it to him. Then he asked for my visa, I showed him the page. Then he asked for my passport. I pointed at it. He was confused and didn’t realize that they were both in the same blue book. I didn’t feel great leaving my identity, my most valuable possession, and my ticket out, left at the hands of a 5 foot short jittery man as he disappeared into the cracks of the village so I followed him, keeping my eyes on my passport the whole time, and giggling to myself about how ridiculous it must have looked to have this tiny man chased through the back-alleys, canal sides, and markets of this compact and hectic fringe town by a white man, drenched with sweat almost double his size. We passed through settlements above, where people subside off of honey collecting, shrimp farming, and live in mud thatched houses, many of which had solar panels on the roofs and satellite dishes on the sides. But the villages were primitive and far more interesting than any of the wildlife we saw (some birds, mud skippers, crabs, a couple of lizards, deer, a wild boar, and the fin of a dolphin). There was a troupe of young IT engineers at TATA, one of the biggest Indian multinationals, that reveled at the sight of deer. Understandable for people that live in the thick of a city like this. For me, the wildlife touring was significantly less interesting that watching the settlements on the fringes of the wildlife sanctuary and national park. But the day cruise that followed was peaceful and highlighted by sunset and sunrise in one of the remotest and wildest places I’d ever been. I slept that night, outside my cabin could have been the set of the heart of darkness but I rested pretty soundly with malaria-pill enhanced dreams and was happy that I slept through the night without being awoken by a masked robber.